Young boy found inside a carton in a gutter in Yaba, Lagos. 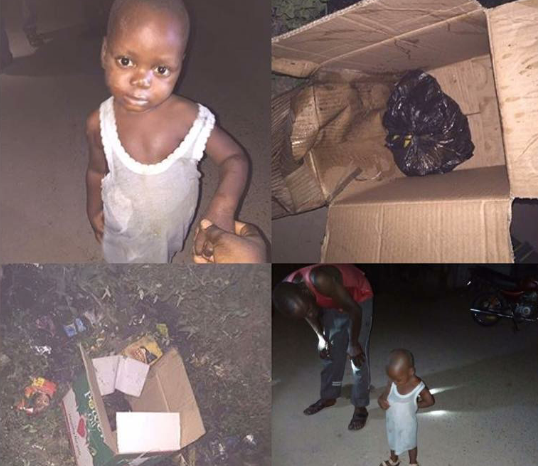 Opc vigilantes found a Young boy inside a carton in a gutter in Yaba, Lagos. "This boy of about a year old was put in a box and dumped in the gutter on Alara street in yaba today 25th december, 2016. May God almighty forgive whoever did this to this innocent soul! I am here trying to imagine what the parent would say to people who knew him!" Amongst comment made by followers of Instablog9ja, one emphatically stressed that it should be ensured the boy doesn't fall into the hands of those who dumped him In the first place, an ideology I strongly support.